Halloween is just the start of the holiday trifecta. Then comes Thanksgiving and Christmas. To help you deal with the stress of getting ready for this holiday season here are seven tips that can help you enjoy the holiday season even more. Plus links to over 60 more ideas to keep the joy in the holiday season. Take a look at all your holiday activities and see what are the most meaningful things that you do. Eliminate those things you don’t love or get a great deal of joy from. Focus on quality, not quantity. Make a no-gift rule. Instead, give your spouse and family the gift of your time. 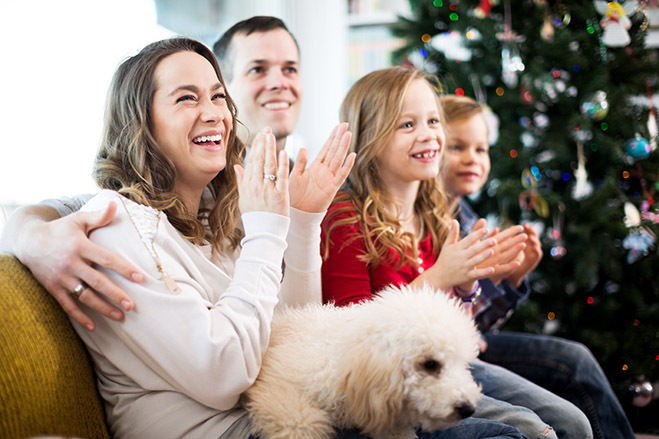 Plan a movie night, family dinner or game night and enjoy spending time together. Happiness experts say that spending money on experiences versus stuff makes us happier. Less can be more during the holidays. Sometimes extra shopping, parties, and can be overwhelming adding to stress and unhappiness. So consider doing less. Even plan a special day to relax with family doing absolutely nothing but maybe watching a good movie, reading or taking a walk. Family gatherings and holiday activities are special. Celebrate by taking lots of photographs. When the holidays are over you can relive the good times. You can also print photos or create photo albums for gifts for birthdays or the next holiday season. Make a date with mother nature during the holidays. Go to the park or a local nature preserve. When we experience nature we recover from stress faster. Last but not least, stay healthy. Nothing puts a wrinkle in your holiday season like coming down with a bug. Superberries products can provide you with antioxidant-rich Aroniaberry products to help support your overall wellness. Add Aronia to your diet every day. Also if your energy is running low, take Aroniaberry+ Shots or Aroniaberry Gummy Chews with you. Here are links to over 60 ideas how to get more joy during this holiday season.